APA formatting says that I should double space the reference list, but I can't get rid of the extra line when I type it in Word. If you need to change Word document formatting, it is best to strip out Word's default settings, which are set at "Normal". The elements of the Normal style are Calibri font, size 11, single spacing with an extra line between paragraphs and right justification. The simplest way to edit the formatting is to change to the "No Spacing" style, and reset the font, spacing and indentations etc as you require. 1. 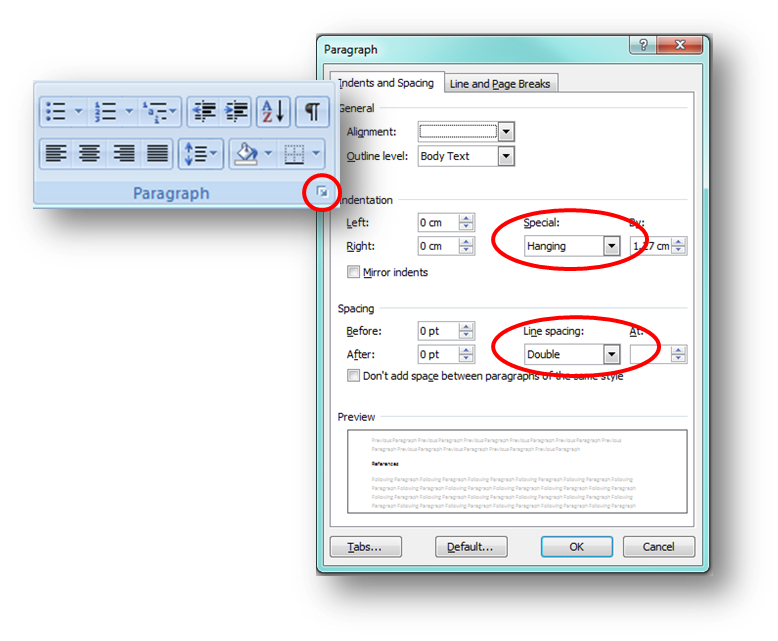 Highlight the necessary text and click the "No Spacing" button in the Styles group. 2. With the text still highlighted, click the small arrow in the Paragraph group which will open a dialog box. 3. Under the Indents and Spacing tab, select 'Hanging' from the Special dropdown list and change the Line Spacing to 'Double'. You can also change the font and size if necessary.